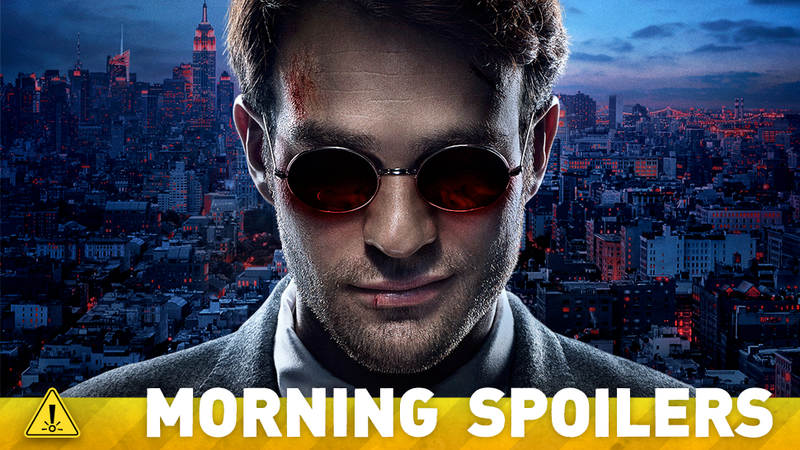 Does The New Daredevil Teaser Hint At Matt Murdock's Red Costume? Oscar Isaac talks about Poe Dameron's future after Episode VII. Who could Watchmen's Jackie Earle Haley play in Suicide Squad? Watch a new Poltergeist teaser. Plus more hints for how Caity Lotz could appear in the new Arrow spinoff. And teasers for what's to come on iZombie, Arrow, and more. To Me, My Spoilers! And your next director isn't too shabby either. Are you excited about working with Rian? They're doing these spinoffs now. Is there any possibility for your character to star in one of those? I don't know, you're going to have to ask them about it. But, the actual work — the scenes with me and Paul Rudd, and Judy Greer and Michael Pena — felt like an indie film. It felt like fun. [Director] Peyton Reed [and the studio], they weren't mercurial about the script. They weren't mercurial about the humor, at all. They let us be in charge of that. We improvised a lot. Judy Greer's very funny. Paul's very funny — he's a great improviser. The rewrite of the script that Paul did with McKay — and I've worked with McKay before — lent itself to that. Yeah, it's definitely going to be on a much bigger canvas than the originals, which were much more small, niche genre horror movies. My version of The Blob's going to be more sci-fi. The blob itself will be more sophisticated, more along the lines of Alien and Predator and things like that - much more science-based, the way Jurassic Park made you believe you could bring back dinosaurs with a bit of DNA from a mosquito. This will be much more explained on where the blob comes from and how it works. It'll be a much more sophisticated creature - because it is a monster movie rather than a horror in that sense. It will be on an epic, cinematic scale more. It's more of an invasion movie, I suppose. This thing's come from another planet, and also, we don't know how many there are. It's fun at the moment - while I'm prepping this other film, The Blob is a bit longer term. I'm having a lot of designing this creature, what its talents are, its attributes, how you can think you've defeated it, but you haven't. It's fun inventing a creature like that - like the new Alien or the new Predator. I actually think I shot for quite a while before I even met Paul [Wesley], so most of her initial stuff is with Damon. It's actually Damon's plan to have mama be the thing to help Stefan out of his humanity-off phase. That doesn't necessarily mean things go according to plan, but that's the idea. … She tries her best to be what her sons want her to be, but she's a very different woman now. So this is the first time we've seen Ward since the show has come back. I assume we'll find out what he's been up to while our team has been dealing with Skye's powers? We call this "Love In The Time of Hydra," and so you're going to see what happened. At the end of "What They Become," which was our mid-season finale, Agent 33 and Ward limp off together towards the sunset. And this episode will bring us up to date and see what that has meant. And as the poster suggests, love is in the air. Love is in the air with who? That's my question! "He does not behave like a king in my dreams." "The gods find us in our sleep, the message was clear. The Nazarene is a good man." "Advice from men who fear his popularity may eclipse their own." "I've done the most terrible thing, for which there can be no forgiveness." "I think she truly believes he will rise from death." "We have some really good Oliver/Diggle moments [in] The Offer, and we have some incredibly confrontational Oliver/Diggle moments in the latter part of the season that I think will have implications that reach past this season," Stephen Amell answers. "And we have a lot of Oliver and Felicity in Episode 20, because they're away with Diggle and some other people on a mission." "You should read these scripts. They're really good," was all that Tennant let slip regarding the Netflix series David before mentioning the famous Marvel Snipers. As a long time comic book fan Tennant revealed how excited he is to work with Marvel saying, "this is something I grew up with. It's like my eight year old self doesn't know what to do with himself." THINGS ARE STARTING TO GET PERSONAL — When Clive (Malcolm Goodwin) identifies a John Doe in the morgue as one of his former criminal contacts from his days on the vice squad, Liv (Rose McIver) is surprised that Clive is so quick to refuse her help in solving the murder. Liv and Ravi (Rahul Kohli) investigate on their own which puts them in a precarious situation. Liv's problems continue to mount when Major (Robert Buckley) begins searching for a roommate and she believes he's considering a cute co-ed. David Anders also stars. CONTROLLING THE DEMON — When Eva Sinclair's (guest star Maisie Richardson-Sellers) reemergence leaves Rebekah trapped and helpless, Klaus (Joseph Morgan) is forced to put aside his mistrust for Freya (guest star Riley Voelkel) in order to save Rebekah's life. Meanwhile, Hayley (Phoebe Tonkin) and Elijah (Daniel Gillies) learn more about Eva's violent past from Josephine (guest star Meg Foster), who then makes a startling revelation about Hayley's future. With time running out to save Rebekah, Marcel (Charles Michael Davis) turns to a reluctant Vincent (Yusuf Gatewood) for his help to take down Eva, but his plan takes an unexpected turn, as Eva will not go down without a fight. Danielle Campbell also stars. Ah yes, this spring's burningest question: Will she play Sara, and if so, how will that character be resurrected? Or will she play someone new? "We definitely noticed that people have been asking those questions and we're glad. And we kind of want them to ask those questions a little longer," says Marc Guggenheim, an EP on the spinoff project. "I would say that by May you'll know the answers to those questions, but we're going to keep those cards a little close to our vests for a while." Considering that Arrow's third season will still be on in May, and the show is teasing its imminent introduction, it looks like Sara Lance could be taking a dip in the Lazarus Pit soon. For one, I can tell you that Liam McIntyre's Weather Wizard will be back not just next week, but in another episode airing later this season. Also coming up are assorted flashbacks, to help flesh out some characters' pasts. "In Episode 17 (airing April 1), we're going to get a flashback from [Dr. Wells'] point of view, which we're really excited about," says EP Andrew Kreisberg. "And in [another] episode, everyone's going to flash back to when Barry was in the coma. So, you'll see that time from Wells' point of view, Caitlin's point of view, and Joe, and Iris…. You get to fill in a little bit more of the backstory." TVLINE | Hook is being conspicuously and admittedly mum about his past with Ursula (played by Merrin Dungey) — is it for a good reason? Yeah, you find out exactly went on in their past — and as most people have guessed, Hook doesn't come out too well. He tries to help a young Ursula (The Following's Tiffany Boone) run away from her father Poseidon (Ghostbusters' Ernie Hudson), but as is always the case with ol' Hook, he makes a couple of questionable decisions. It doesn't necessarily go the right way. But in the present day, he's trying to take a leaf out of Emma's book, offering Ursula a chance at her happy ending in exchange for finding out what Gold's real plan is. Given that icy reunion, it's obvious that his attempt to help her didn't quite go according to plan — what can you preview about his motivations during their flashback encounter? Does he feel any remorse for how things transpired between them in the past? You see that in present day, Hook decides to take a leaf out of Emma's book and he offers her a chance at her happy ending in exchange for finding out what Gold is really after, and so Hook at the minute is trying to be the best man that he can be, because he genuinely loves Emma and he wants to make a real go at it. Sometimes he makes mistakes, but everybody does. The Pack has things under control when the Council of Alphas reassembles at Stonehaven until a surprise visit from Savannah upends their plans. Meanwhile, Nick and Paige inadvertently bring danger to a loved one's doorstep.